This 10 bedroom villa with swimming pool is located in Choeng Thale and sleeps 20 people. It has WiFi, parking nearby and air conditioning. The villa is near a beach and within walking distance of a restaurant. Picasso Villas is a 2-villa vacation complex, housing 2 modern private pool luxury villas in Bang Tao, Phuket, Thailand. The 2 villas inside the complex are Villa Pablo and Villa Paloma and they are true twin sisters with the same appearance on the outside but individual characters on the inside. The villas can be rented out individually or together, accommodating travel parties up to 25 guests - great for big family getaways or special events. The architecture of the two villas is identical, featuring modern double-storey buildings with terraces on the first floor. However, the interior designs are completely different. Villa Pablo is inspired by football legends, featuring rate collector's items and football artefacts. Villa Paloma features retro 1950s furnishings and decorations, inspired by Jane Mansfield. Both villas are designed for the comfort of guests, wonderfully luxurious and contemporary. 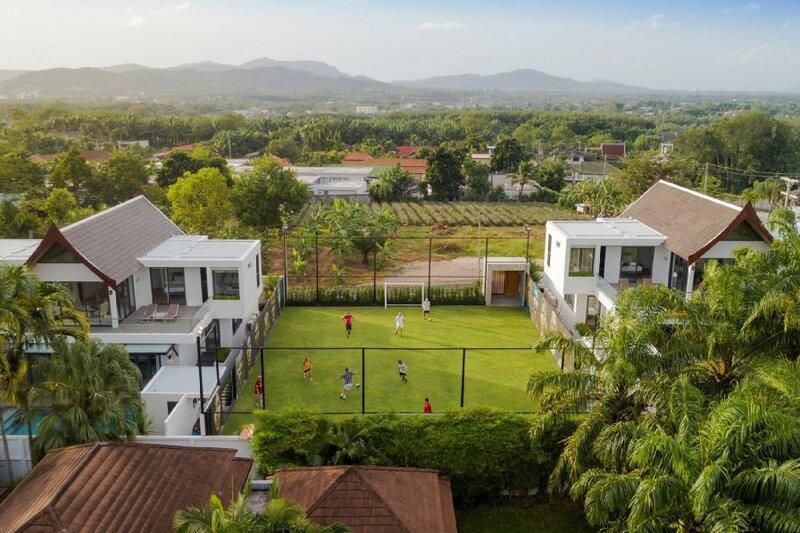 In between the two villas, lies a FIFA-approved mini football field to kick a ball and have lots of fun with friends and family. A professional football coach can come over to the villa if you want to get serious about the sport. Comprising 2 stand-alone luxury villas, Picasso Villas boasts plenty of places to relax, lounge, dine and have drinks. After all, there are 2 garden, 2 swimming pools, 2 living areas and 10 bedroom suites. The gardens feature crystal clear private swimming pools and poolside decks with seating arrangements, daybeds and alfresco dining options. The living areas are designed with bi-fold glass doors to enjoy tropical open-plan spaces when the sun is out and closed-off living spaces after sunset. Perfect! Both living rooms are equipped with modern comforts and more. There are sofa sets, TVs, dining tables, kitchens and breakfast bars with high chairs. Upstairs, there is more to be discovered. Villa Pablo features a billiard table while Villa Paloma boasts an original 1950s sofa set, antique artifacts and framed posters of Jane Mansfield - really cool,chic and retro! Having said that, the main living room at Villa Pablo boasts signed T-shirts of great football legends such as Pele, Beckham and Maradona. Pretty cool, as well! In total, the estate houses 10 bedrooms, each equipped with AC and ceiling fans. The master suites are found up on the first floor and each of these king-bedded bedrooms is adjoined by a large, breezy terrace where you can sunbathe and gaze at the view of green hills and other tropical greenery of Phuket Island. The master suites feature TVs for entertainment, writing desks, sofas, dressing areas and private en-suite bathrooms. 1 of these bathrooms boasts large soaking bathtub to relax in at the end of the day. 4 of the guest bedrooms are located on ground level, fitted with twin beds and equipped with television sets. The last 2 bedrooms are slightly smaller but they have separate entrances, perfect for those who want a bit of extra privacy. Every bedroom has their own private en-suite bathroom.